If you want to experience the real Japanese tradition in your own country, let me represent you 10 best sushi making classes in NYC. Making sushi is an art, like any other culinary area, and watching videos on Youtube or looking for the recipe in some cookbook won’t bring you the real technique of making sushi. If you type on Google ‘’How to make sushi?’’ you will find various sites like Make My Sushi and Make Sushi that will provide you information about the whole history of sushi, as well as appropriate equipment and stores where you can purchase those items, but if you are like me, you would want some professional to teach you through practice. New York is the city that never sleeps and every day something new pops up, which makes New York even more interesting. Being the multinational city, in NYC you can meet all the cultures it the world through various programs. The most common ones are culinary programs such as restaurant cooking classes. If you are a gourmand or just in love with the culinary art, you may want to try some of the 11 Best Bread, Pie, Pastry, and Cupcake Baking Classes in NYC. 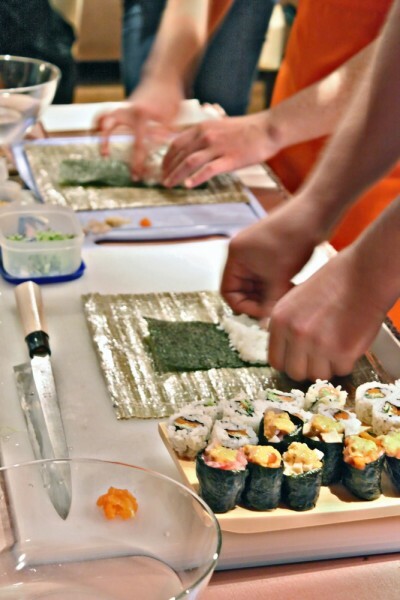 But if you are Japanese cuisine kind of person, we recommend some of the best sushi making classes. Sushi is basically fish and rice, but as you might notice if you ever made some meals from those ingredients, that neither tastes or looks like sushi. There is a special technique to make the perfect, traditional sushi, and if you want to save up some money,Eat-Japan provides all the information you need. But as I already mentioned before, unless I see it, I won’t know if I am doing it right. There are several types of sushi you should try out. The most common and also the most expensive is Nigiri sushi, made of raw fish or any other seafood slices placed over vinegared rice and can be spiced up with ginger, wasabi or soy sauce. But most famous is definitely Maki sushi, which is the filling of fish or vegetables enrolled in the vinegared rice and tight with seaweeds. Every time I read ‘’raw’’ I get really sick, but when it comes to sushi, this feeling stops as soon as I taste it. There is one more reason to attend some of the sushi making classes. One sushi roll costs between $6 and $12, which would be nothing if one sushi roll is enough for you. But it never is, and you have to eat at least 10 rolls to stop feeling hungry, which brings us to the next issue and that is the date. If you want to impress your date by taking them to a sushi place, just for this one dish, you will pay approximately $150, and this price does not include drinks or anything else on the menu. So the better way to impress your date, and maybe the best way in general, is to make the sushi in your own kitchen. To do that, you will need the best sushi making course you can get for the lower price, and we are here to help you find the one. For compiling this list of 10 best sushi making classes we consulted several sources and compared it with Vimbly to help us with ranking. On Vimbly you can browse any kind of class or restaurant or any other activity you are interested in and they will help you reserve your spot for the lower price. So buckle up and let us guide you through 10 best sushi making classes in NYC!